When schoolchildren in Washington, D.C., are asked to say the first thing that comes to mind about Africa, they use words like hot, desert, sand, poverty, hunger, war and Ebola. These are all accurate things to say about that part or the world — but they reflect an "incomplete" picture, says writer Austin Merrill, who together with photojournalist Peter DiCampo has set out to document African reality beyond common stereotypes. They are the founders of Everyday Africa, an Instagram community of photographers who strive to capture ordinary moments of life, such as children picking flowers in a field, or girlfriends chatting at a coffee shop. Their Instagram following has topped 370,000. 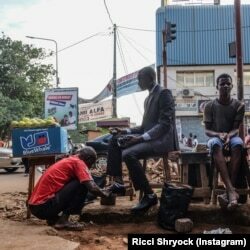 Ricci Shryock: An accountant gets his shoes shined on his way to work in Conakry, Guinea. In addition to the Instagram feed, the book "Everyday Africa, 30 Photographers Re-Picturing the Continent," recently hit bookstores in Europe, the United States and certain countries on the African continent. The book is filled with images documenting life in Africa that aim to shatter misconceptions often found in Western media. 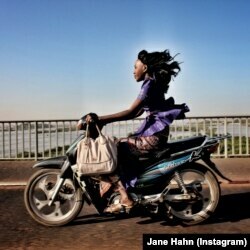 Readers see a teenager rollerblading in the streets of Dakar, a DJ playing music in Lagos, a couple looking at the Atlantic Ocean in Cape Town. The book displays the full diversity and visual richness of African life. Both DiCampo and Merrill invited a diverse “community of photographers” from all over the continent to contribute to the Instagram project and the book. Some are professionals, while others are skilled amateurs. Ethiopian-American writer Maaza Mengiste prologues the book in an essay focusing on the power of the ordinary. “We sometimes forget that no matter what is happening in our lives, ordinary moments find a way to move forward," Mengiste writes. The instagram feed "Everyday Africa" was born out of a collaboration between photojournalist Peter DiCampo and writer Austin Merrill, seen here in Ivory Coast. 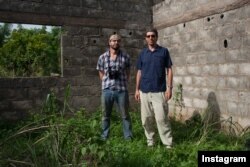 Peter DiCampo and Austin Merrill, both Americans, met while serving with the Peace Corps in Ivory Coast. In 2012, they received a grant from the Pulitzer Center on Crisis Reporting in Washington to cover the aftermath of Ivory Coast's civil war. “We were seeing all these other moments, that were much sort of truer to our daily life experience in that part of the world,” says DiCampo. 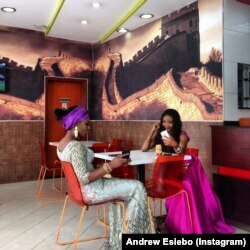 Two women and their cell phones in Lagos, Nigeria. @andrewesiebo from the book "Everyday Africa: 30 Photographers Re-Picturing a Continent"
This is the gap that the "Everyday Africa" book is trying to fill; to look at the continent from the inside and from different perspectives. DiCampo and Merrill, with the support of the Pulitzer Center, have also created media workshops that train elementary school students in the United States on how to document their lives and recognize stereotypes. 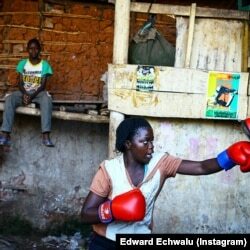 Edward Echwalu:A female boxer trains inside a makeshift gym in Katanga, Kampala, Uganda. This social media model has hit a nerve. “The Everyday Africa platform on Instagram may very well be the biggest visual library of the continent,” writes Ghanaian photographer Nana Kofi Acquah. “To task African photographers with the burden of changing how the continent is perceived, might be overwhelming,” writes Acquah; but, he adds, “a picture of the real Africa” is slowly emerging.